Synergist is the UK's leading job costing and project management system for creative / digital agencies and project-based businesses. Gain control of your projects and business with live visibility, so you can focus on what's important. Gain control of your projects and your business with live visibility, so you can focus on what's important. You can choose. Do you want your Synergist system to be in the cloud? Or on your premises? It’s your call. 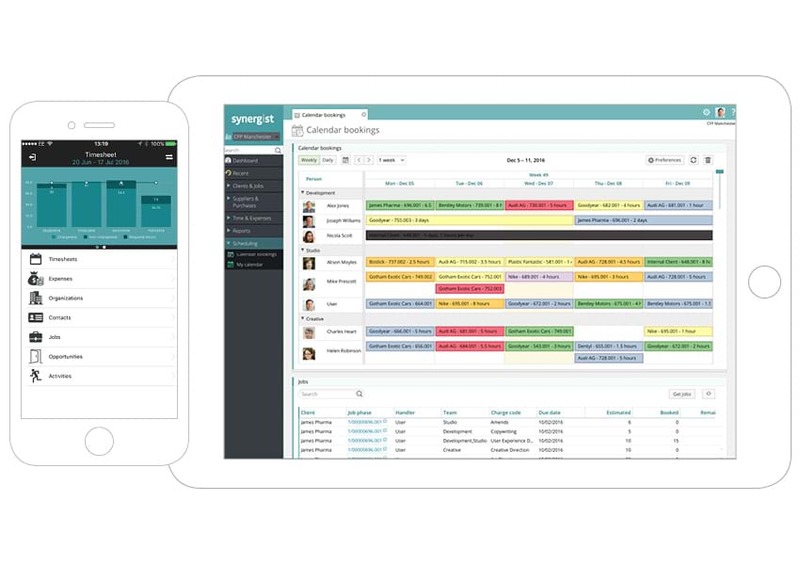 Either way, don’t forget that Synergist is also accessible from iPad, iPhone and Android devices, so you and your team can use it wherever they are. Synergist will help you uncover insights, issues and trends that mere project management software can't deliver on. Why is your hard-earned profitability leaking away? What unexpected inefficiencies are present? What sort of projects should you be aiming for? With all your business intelligence in one place, you and your team will be able to optimise project management, gain financial control, steer your company and receive early warnings. 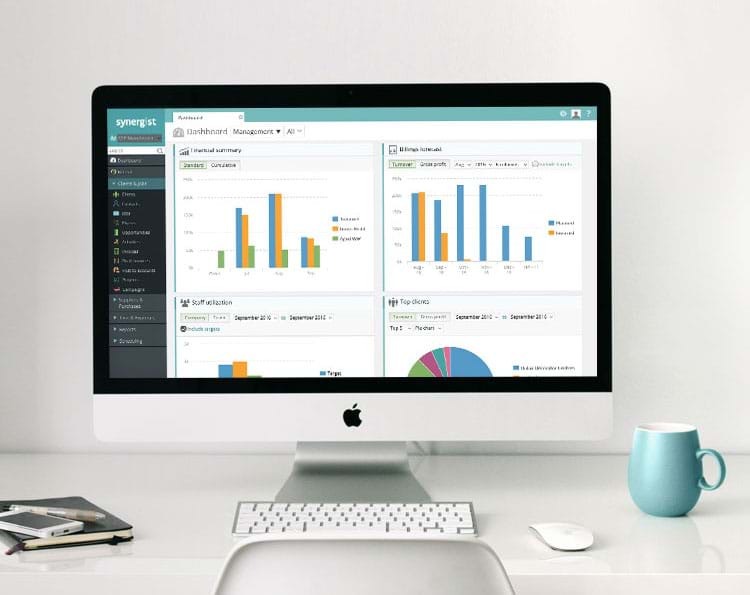 Synergist gives you tools and KPIs to support your growth: 10 to 500+ employees use exactly the same software throughout. Synergist is renowned for its powerful financial control offering, pulling operations and financials together into one coherent whole. Synergist also helps you track leads, ensure they are being followed up, manage to-do lists with email reminders and view the business pipeline. “If Synergist was somehow taken away from us, it would be worse than us having a fire. We have disaster recovery for fire. But not having our system would bring delays in everything we do, and we'd lose the visibility everybody wants." Synergist is an amazing tool and we are absolutely delighted with the results. Synergist seemed head and shoulders above the rest, but what we didn't know was how absolutely fantastic the after-sales service would be. In my opinion, Synergist more than paid for itself within the first year. Implementing the Synergist software within a two month period has been straightforward and well supported by the Synergist team and helpdesk. We would not hesitate to recommend it. We chose Synergist as a replacement to a manual system that we now realise was very outdated. The time and money it has saved us in the last eight months is incredible. Synergist has proved to be excellent value for money! It ’s helped us to cost jobs better. Previously we wrestled with very complex spreadsheets to work out the costings, and that’s all been replaced now. We’ve dumped so many spreadsheets! One big reason for implementing Synergist was to avoid wasting so much time running the mechanics of the agency when we want to focus purely on clients. So, when planning our growth we went for ‘lean growth’. There comes a time in every agency’s life when you stand back and have to decide where you want to take it. We decided to get serious. Preparing the agency for growth, getting the basics right... And getting a serious system to drive through the efficiencies and be able to grow with you. Getting Synergist was a key part of it, and I’m glad we did it. It's educating the team. They make better decisions now. It promotes self education. Team members are much more aware now of what costs go into a job. Clients are more frugal today, more savvy. It's never been more important to be able to deliver efficiently.